SOLD OUT. 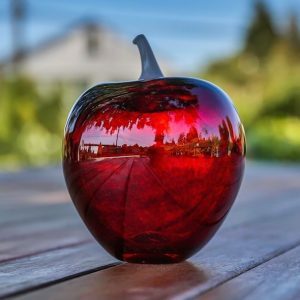 The 2016 edition White Center Food Bank apple is transparent dark ruby red with a white stem. A full 50% of the purchase price benefits the White Center Food Bank, that is enough money to supply 200 pounds of food to the community, per apple! Each apple is approximately 4″ tall, is signed and numbered, and comes with an informational card explaining your donation. Learn more about the Glass Apple program here. To order, contact us, glasssales@avalonglassworks.com, 206-937-6369.